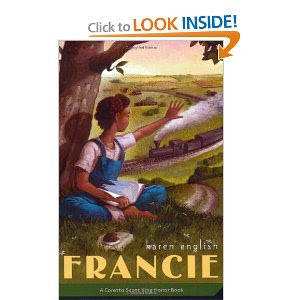 Francie is the story of a young black girl who lives in Alabama. Her father is working in Chicago and sending money home. Francie begins tutoring Jesse, a young man who can't read. His father pulls him out of school and makes him go to work, then the father runs off leaving him on his own and his younger brother and sister in the care of relatives. Jesse is fasely accused of assaulting a man. Francie has to decide whether to risk her family or to help her friend. The lessons about bullying, discrimination, hardship and believing when it is easier to give up are all there in this wonderful book. I found myself getting angry with the way some of the whites treated the blacks. When the sheriff was looking for Jesse he walked into Francie's house to look around without permission. Worse than that, her mother had made a welcom homecake for her father and the sheriff helped himself to a chunk of the cake. I guess my feelings were so strong because I grew up in a non-prejudiced home and the prejudice was evident here. Several of my students read this book for their summer reading project. However, Cheyenne kept insisting I read the book and actually brought hers in for me to borrow. This is a book I must now purchase for my shelves. I have put a piece of paper up for my students to make book recommendations to me since so many of them have read books I haven't and I am learning that this group of kids seems to know what is good.